The consequences of unprotected gutters can become quite severe. Clogged gutters subsequently destroy your home’s exterior and foundation. Fortunately, we produce a line of RAINTRAP gutter protections made specifically to prevent gutter obstruction. Furthermore, RAINTRAP saves you from having to perform risky gutter cleanings. As specialists in home improvement products, you’re guaranteed valuable results. Eliminate the messy hassle of cleaning clogged gutters by having an attractive and affordable RAINTRAP S-LOCK GUTTER PROTECTION system professionally installed on your existing or new gutters today! With 9 colors to choose from, your RAINTRAP gutter protection will effortlessly blend in with your roof and gutters. It’s available in many colors to blend well with your roof and gutters. 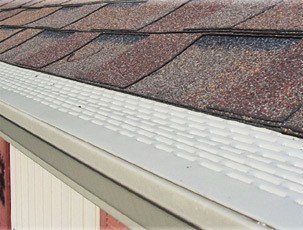 Adapts to a variety of gutter and roof combinations. Made of rigid metal that resists buckling and prevents birds and squirrels from chewing through them. Will not clog or collapse like screens or plastic protections. Has a smooth surface so debris will slide off. Is secured without fastening to the roof so it does not violate your roof warranty. Does not have a flat or recessed surface that will collect trash. Handles larger volumes of water than most other systems. Openings on the top surface are small enough to keep significant trash from entering the gutter, but large enough to prevent tree sap, dirt, and mold from clogging the cover. Fits securely around end caps to keep small birds and rodents from nesting in your gutters.